Don’t Miss the Bus for the 2017 Georgia/Florida Game! It’s that time of year again, time for the 2017 Georgia vs. Florida Football Game! We understand Game Day traffic can be a hassle and that lining up reliable transportation can be stressful. That’s why we’re proud to announce that we will be providing round-trip transportation for the big game again this year. Guests are invited to travel in comfort on one of our four motor coaches without the worry of navigating annoying big-game traffic or arranging for designated drivers. The King and Prince has you covered! Remember, seating is limited and WILL sell out so if interested in this opportunity, please fill out the form below. Email the completed form along with a front and back copy of your credit card to ssikp.resagent7@mmihg.com or call the resort at 912.638.3631 for more information. 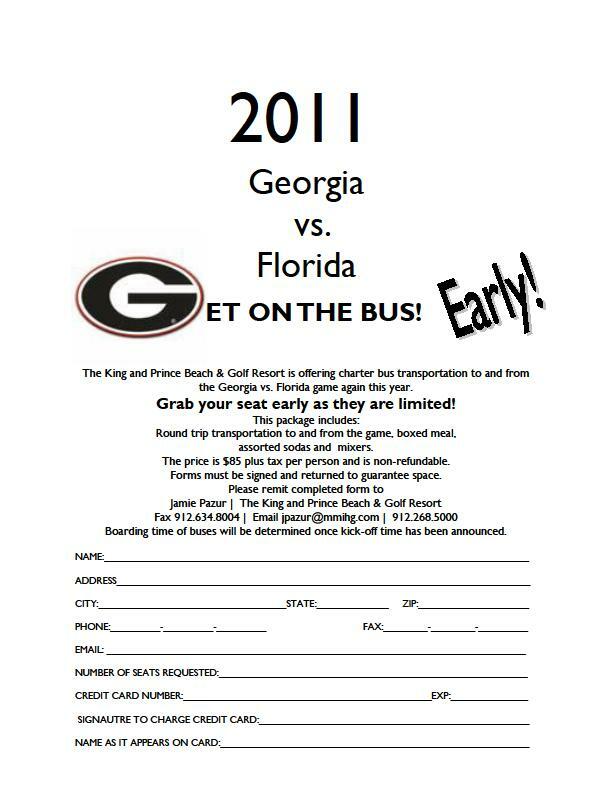 Catch the Bus to the 2015 Georgia/Florida Game! It’s that time of year again, time for the 2015 Georgia vs. Florida Football Game! Traffic on Game Day is never fun, neither is stressing about reliable transportation. That’s why we’re providing round-trip transportation again this year. The King and Prince will be chartering 4 motor coaches so that you don’t have to worry! We WILL sell out of seats! If you’re interested in this opportunity, please fill out the form below. Email the completed form along with a front and back copy of your credit card to bharrell@mmihg.com or call the resort at 1-800-342-0212 for more information. Looking for 2016’s bus info? Click here.